OBJECTIVE To study the clinical characteristics of cluster headache in women. 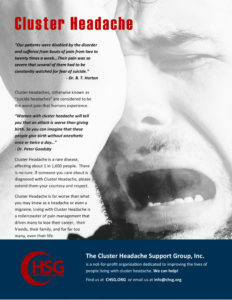 Cluster headache is a disorder of men (male to female ratio 6–7:1). METHODS Retrospective chart review to identify all women diagnosed with cluster headache at an academic headache centre from January 1995 through July 1998. RESULTS Thirty two women and 69 men were identified. The mean age of onset of cluster headache was 29.4 years in women versus 31.3 years in men. Two peaks of onset in women (2nd and 5th decade) were identified compared with one in men (3rd decade). Episodic cluster headache was present in 75% of women and 77% of men. Women and men had on average 3 attacks a day, but attack duration was shorter in women (67.2 minutesv 88.2 minutes). Cluster headache period duration (11.1 weeks v 10 weeks) and remission periods (21.1 months v 23.1 months) were similar in women and men. Miosis and ptosis seemed to be less common in women (miosis 13.3% v24.6%, ptosis 41.9% v 58.1%) whereas lacrimation and nasal congestion/rhinorrhoea were almost equally prevalent in women and men. Women had more nausea than men (62.5%v 43.5%, p=0.09) and significantly more vomiting (46.9% v 17.4%, p=0.003). Photophobia occurred in 75% of women and 81.2% of men, and phonophobia occurred in 50% of women and 47.8% of men. CONCLUSIONS The clinical characteristics of cluster headache in women are very similar to those in men. Women develop the disorder at an earlier age of onset and experience more “migrainous symptoms” with cluster headache, especially vomiting. Both men and women have frequent photophobia and phonophobia with cluster headache attacks. These symptoms are not included in the International Headache Society cluster headache criteria, suggesting the need for possible criteria revision. Download and read entire article at BMJ.